The User Manual for Aibotoys Bulls-and-Cows is available online in PDF format. Click here to view the manual. The User Manual for Aibotoys Hangman is available online in PDF format. Click here to view the manual. The User's guide for Aibotoys Gamepack One is available online in PDF format. Click here to view the instructions. If you need Acrobat Reader, you can download it for free from Adobe by using the following link. Aibotoys Gamepack One is a collection of four games for the whole family: AiboReversi, where you can play the Reversi game against Aibo; AiboMemory, where you can exercise your memory by matching similar cards on a board; Tictaibo, the Tic-Tac-Toe game for Aibo and first third-party game available for Aibo; and AiboDice, where Aibo rolls a virtual die for any other game you play. AiboReversi allows you to play Reversi, one of the favorite board games around, against your Aibo! When starting Gamepack One, select the AiboReversi game and place your Aibo in front of your AiboReversi game board. Then select the position you want to play using an easy code by pressing the Aibo paw switches, and confirm your move by pressing another sensor (sensor locations vary between Aibo models). Aibo will then think for a little while (usually less than 1 minute), and use an easy code to tell you where Aibo's move will be. AiboMemory is a card memory game where Aibo looks at the cards you placed face down on the large game board, lets you choose two cards with Aibo's pink ball, and tells you whether you have found a pair of matching cards. If the cards don't match, Aibo calls out a sound corresponding to the cards you have selected and lets you try again. The object of the game is to uncover all similar pairs of cards. Tictaibo lets you play the game of Tic-Tac-Toe with your Aibo! In this game, also known as Noughts and Crosses, you try to be the first player to get three identical pieces in line on a 3x3 grid. Pick O's or X's, put your pieces on the board, and see what Aibo has in store for you! AiboDice is a mini-game on Gamepack One where Aibo rolls a virtual die in his/her head, and calls out the number on which the die fell. Use AiboDice whenever you play a game and need to use a die! Aibotoys Gamepack One is available either for the ERS-210/210A, for the ERS-220/220A, or for the ERS-311/312 and ERS-31L series of Aibo robot dogs from Sony. What is the Reversi game? Reversi is a game played on an 8x8 board, using reversible pieces with one white side and one black side. Each player has his color, and the objective is to get the most pieces of his own color on the board at the end of the game. Each player puts one piece at a time on the board, and must circle opponent's pieces at each turn to convert them to his color. You can read a longer description of the Reversi game in the Aibotoys Gamepack One instructions, or at: http://www.gamesite2000.com/reversirules.htm . See also the nice online Reversi game at: http://www.spee.nl/othello/applet.htm. 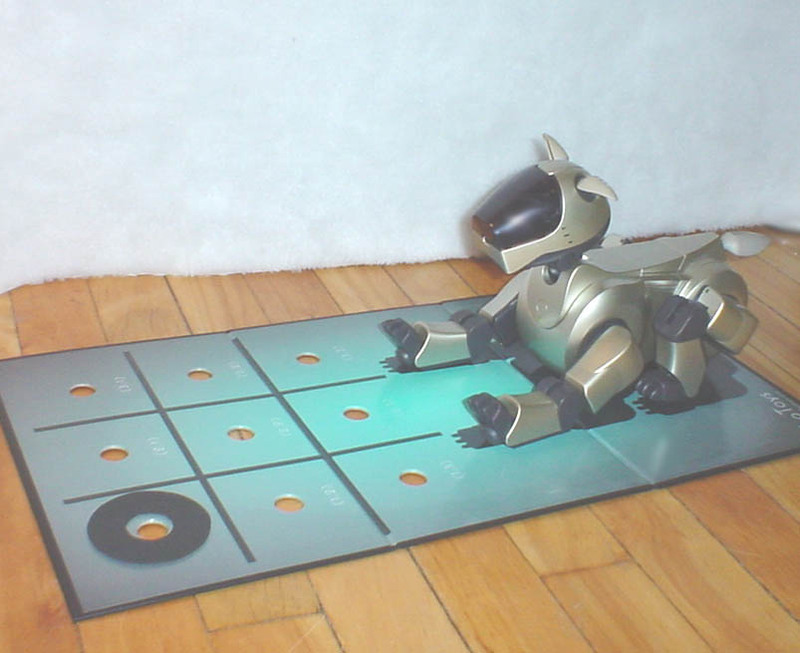 The Tic-T'Aibo game allows your Aibo(tm) ERS-210 to play Tic-Tac-Toe against a human opponent (or a second Aibo) on a 1 foot square board. To play your moves, place Aibo's pink ball on the board game at the position you wish to play, and watch Aibo's ear movements to know in which square Aibo's move will be. Aibo will use his image recognition to locate the ball on the board, see on which square you played, then make his move by signalling with his ears to tell you where that move will be. The game continues until one of the players wins or there is a draw. As you play, place X's and O's on the game board so *you* remember where the pieces are... Aibo will remember by himself! Apart from the japanese-only "Aibo Cards", this is the first Aibo game available on the market! To use the Tic-T'Aibo software, just open the door on Aibo's stomach, and insert the game memory stick in the slot. To start the game, place Aibo lying down on the game board and press the Pause button to turn him ON. After Aibo has stretched, adjust the position of the paws to cover the paw images on the game board, making sure the tail is also centered according to the Aibo image on the game board. Right after Aibo has stretched, he will immediately start a game and begin to look for his pink ball... Just position Aibo correctly on the board and you are ready to play! 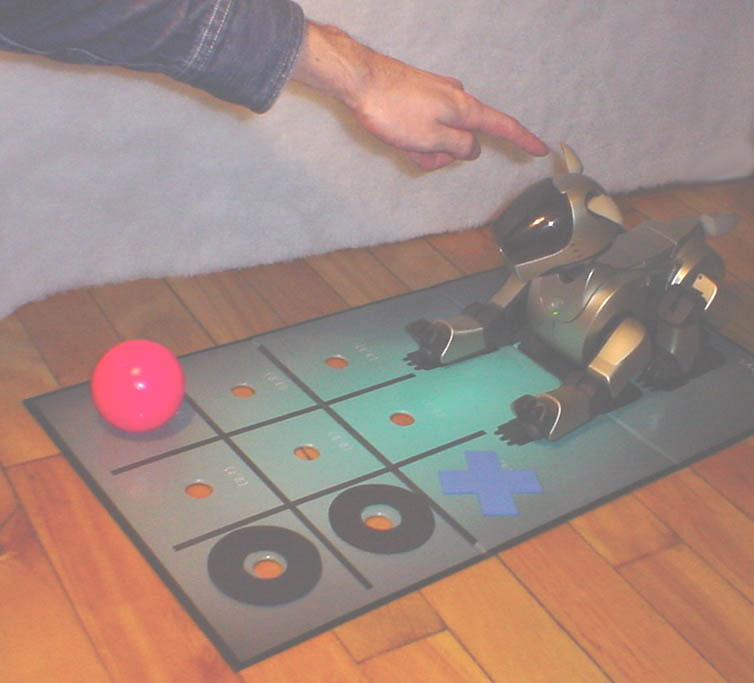 You play Tic-Tac-Toe against Aibo by placing his pink ball in the square you want to play, on the playing mat. While you do this, Aibo looks around to find the ball; press Aibo's head sensor when you have decided on the position you want to play. Aibo will then think for a little while, then tell you which position he plays by signaling with his ears. Aibo tells you when the game is over by making an appropriate dance, and allows you to start another game. When you turn Aibo on, a game is started immediately. Aibo tells you a game is about to start by starting a "countdown" with the appropriate sound and eye movements, exactly the same as when the Aibo is about to take a picture. Don't worry; he's not taking one! Aibo always lets you start playing first. He will let you know it's your turn to play by emitting a random "short happy sound" that you sometime hear while using Aibo Life. If you want Aibo to start the game, just press the back sensor when you are about to make the first move of the game, to skip your turn. If you don't want to play by the rules and let Aibo play many moves consecutively, you can always press the back sensor when it's your turn to play, to let him play right away! For every "double-click" with the right ear, move one square to the right starting from Aibo's upper-left corner. For every "double-click" with the left ear, move one square down starting from Aibo's upper-left corner. Each square is numbered on the game board, so you are sure to place Aibo's game piece on the correct position. (left ear) "Click-click", "Click-click", "Click-click"
Don't worry if you missed which position Aibo just signalled with his ears! When it's your turn, you can always ask Aibo to repeat the signal (with his ears) by pressing the front paws sensors! At any time, you can start a new game by pressing Aibo's chin sensor for 2 seconds. As always when operating your Aibo, be cautious not to apply force when Aibo is trying to move! Occasionally during the game, for example when Aibo rejects an illegal move you're trying to make, he will shift his position on the board. When this happens, make sure Aibo is correctly aligned on the board before continuing to play. Otherwise, he could misinterpret the position you play, and start refusing moves you think are valid. Note on the difficulty level: Aibo doesn't yet try to play a perfect game. At the start of each game, he chooses randomly how hard he will play the game, and plays accordingly. At user's turn: Put pink ball on board, then press head sensor to confirm a move. At user's turn: Press any front paw sensor to ask Aibo to repeat his last move. Don't forget: Aibo can repeat! When it's your turn, you can always ask Aibo to repeat the signal (with his ears) by pressing the front paws sensors! The following picture represents Aibo while beginning a game: Aibo is placed on the game board (aligned properly with the marks on the board), looking at the board. In this picture, the user played a move already, and Aibo has chosen his move. If you look closely at Aibo's ears in the picture, you'll notice the left ear is moving to indicate his move. Since the ear movement is very audible, it is easy to listen for Aibo's move without looking at him, while we're placing X's and O's on the board to take note of the playing positions. Here is a picture of Aibo playing a complete game, after 4 moves have been played and the user is currently playing. 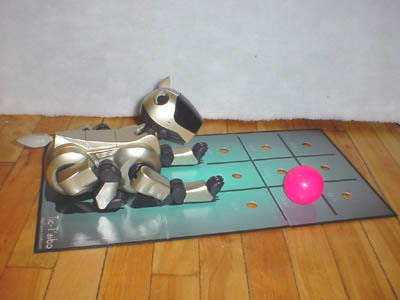 The ball has already been placed on the game board to tell Aibo what move this will be, and Aibo is currently waiting for the user to press the head sensor to confirm the current move. To stop using Tic-T'Aibo, just press the Pause button and wait until he finishes to make sound before removing the battery or changing the memory stick. Will Aibo beat everybody, all the time? No. At the beginning of every game, he will randomly select the difficulty level he will play; sometimes he will play very dumb, sometimes he will try to defend himselft, sometimes he will try harder to win. The ERS-220 and ERS-31x (LM Series) version of the game will soon be announced. Stay tuned! In an bold support effort from Sony, the R-Code interpreter will soon be made available by Sony for the ERS-110/111. This makes the Aibotoys games technologically possible to run on those models. Following this, Aibotoys will make every possible effort to make our games available for the older Aibos. Stay tuned for the most recent developments! Read this section if you have trouble playing with Tic-T'Aibo. The game has been throughly tested, and will work if you have the correct setup. This includes having a copy of our original game board! Before playing, make sure you have abundant light around the Aibo (with no shadows being cast on the squares of the playing board), and make sure that Aibo is correctly aligned to cover the Aibo shape on the board. Aibo just moved on a square that I already occupy! This usually happens late in a game, when Aibo is not aligned properly to cover the Aibo shape on the paying board. He will misidentify the positions on which you play, by thinking you moved on a neighboring square. To correct this, just start a new game after aligning Aibo correctly on the marks on the game board. You might also check that the lighting is abundant near Aibo; I usually find having a 100 Watt lamp nearby to provide enough light. If you think all the conditions are met and the game still does that, contact us to have the software verified and/or calibrated for your use. I have not yet seen this to be required. After a game, Aibo is stuck sitting with one paw in the air. Aibo is waiting for you to shake hands! The game was a draw, and Aibo is being a good player so wants to shake hands. Press the paw sensor and Aibo will lie down again and will be ready for the next game. While playing, Aibo looks at other objects or directions than his ball. Your Aibo is distracted! There must be other red or pink objects in his field of view, and Aibo is looking at them instead. Remove the distracting objects around playing area, or install the board elsewhere. "I don't have a copy of the original game board, and Aibo rejects a move on an empty square or mixes up some moves." Although the game may be available without a game board, the vision algorithms are calibrated for the board we sell. Instead of using a hand-made game board, you should try with the original game board. Ordering is easy! What is the Tic-Tac-Toe game? Tic-Tac-Toe (also known as Nought and Crosses) is a game played mostly by american children in schools. It is similar to Gomoku. Tic-Tac-Toe is played on a 3x3 board, and players put X's and O's in the squares alternatively until they have 3 X's or 3 O's in line. There can be 3 outcome for a game: X wins, O wins, or the game is a draw if the board is filled. There are many Java version of the Tic-Tac-Toe game on the Internet; for example see http://rintintin.colorado.edu/~epperson/Java/TicTacToe.html . There is also a fun Gomoku Java applet at http://www.5stone.net/en/topg.html .